It is December 26th and a snowstorm has been piling up drifts around RAID camp for several days. 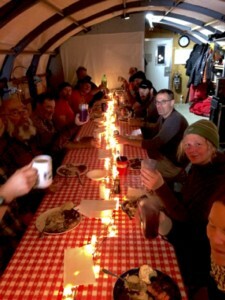 Yesterday we celebrated Christmas with a dinner prepared by the amazingly talented Beth, Shannon, and Jonah. Despite being very far from the nearest grocery store, they made a feast including King salmon and beef roast. There were gingerbread-style cookies, baked and scalloped potatoes, cranberry sauce, real horseradish sauce, and pumpkin pie. Amazing what they can do with frozen food. Miracle workers! Shannon had made a Christmas tree out of a wooden pallet, and gifts were piled under it. What I like about it is that the focus is on giving rather than receiving, and it is good practice for letting go of attachment. A twist is that the giver can give to ANYONE, including someone who already has a gift. In that case, the recipient has to give their first gift to someone else. This is interesting because maybe they really liked their first gift, but then had to relinquish it (hence the letting go of attachment). 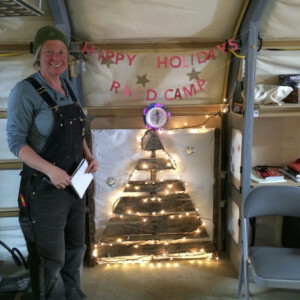 Happy holidays from RAID camp!